Meal prep ideas for 3 different recipes using the same basic ingredients. 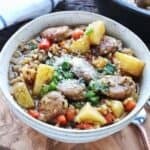 Utilizing chicken sausage, potatoes, peppers, carrots, and onions these recipes are meal prepped on the weekend for 20-minute meals. To a skillet add olive oil and heat over medium-high heat. Add onions, peppers, and chicken sausage. Saute until onions are translucent and chicken sausage is browned. Add the carrots, potatoes, rice blend, and chicken broth. Cover and bring to a simmer. Simmer for 20 minutes or until potatoes are fork tender. Blend in parmesan cheese and season to taste with salt and pepper.